Metallic taste in the mouth may occur. Decrease triglyceride and low-density lipoprotein. levels. Decrease absorption of glucose from the small intestines. Decrease hepatic production of glucose. Increase the tissue response to insulin. Don't take more or less of the drug than is prescribed. Follow your doctor's instructions carefully when taking this medicine. Part of the tablet may appear in your stool. This is normal and doesn't mean the drug is less effective. To help you remember to take it, try to take the drug around the same time each day. The regular tablet is typically taken one or more times a day by mouth, about 30 minutes before meals. Decreases glucose production by the liver stimulates beta cells to secret insulin. Increased tissue response to insulin. Take your dose (with food) as soon as you can, but skip the missed dose if it is almost time for your next dose. Do not use two doses at one time. Symptoms of severe hypoglycemia include extreme weakness, nausea, tremors, sweating, confusion, trouble speaking, fast heartbeats, or seizure. Chlorpropamide is only part of a complete treatment program that may also include diet, exercise, weight control, regular blood sugar testing, and special medical care. Follow your doctor's instructions very closely. This medication is taken orally. Chlorpropamide is usually taken with breakfast or the first main meal of the day. fever, chills, sore throat, mouth sores. severe skin rash, redness, or itching. Treatment of Type 2 Diabetes that cannot be managed by diet only. Chlorpropamide stimulates the beta cells of the pancreas to produce insulin and increases your body's response to it. It also act as a mild diuretic. These drugs increased insulin action at the receptors and post receptor level in the hepatic and peripheral tissue. It also decreases insulin and triglyceride levels. 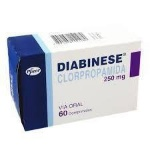 It is effective in treatment of type 2 diabetes. This drug is taken ORALLY. It must be stored in a controlled room temperature. Keep reach out of children. Treatment for patients with type 2 diabetes. it must be stored in controlled room temperature. avoid heat, light and moisture.